If you’re reading this blog, chances are you’re familiar with the horticultural horrors of Japanese knotweed. If this wicked weed wraps its weedy tentacles into your home’s foundation, the results can be devastating for your house and, worse still, catastrophic for your finances. However, not all suspected cases of Japanese knotweed are actually the real deal. In fact, the villainous vine has many doppelgangers and most instances of suspected knotweed are merely a cases of mistaken identity. So, before you take a flamethrower to your back garden and bulldoze your house completely, it’s important to know that you are indeed dealing with the legit Nipponese knot and not a floral facsimile. Annoyingly, there are a wide variety of plants that look like Japanese knotweed. As such, identifying Japanese knotweed can be a tough task and a lot more difficult than you may think. Baring heart-shaped leaves like its Japanese twin, this also has a rapid growth spurt when it first appears in the springtime. However, unlike Japanese knotweed, Bindweed isn’t capable of supporting itself and, instead, makes its vertical ascent by coiling itself around the stems of other standing plants. It also boasts large flowers in the summertime, clearly differentiating itself from traditional Japanese knotweed. Much like Japanese knotweed, Russian Vine has similar looking leaves and flowers, while it is also fast-growing. On the other hand, it is also similar to Bindweed in that it relies on other plants to grow upward, twisting and climbing around the stems of taller, more solid vegetation. The most widely known of its contemporaries, bamboo grows tall like knotweed and also has visible nodes on its stem, making the two very similar in appearance. That being said, bamboo stems are considerably more dense than its Asian brethren and boast a strong sturdiness lacking in Japanese knotweed. Bamboo leaves are also notably narrower and longer. Part of the same family, Broadleaf Dock shares numerous characteristics with Japanese knotweed, from its arrangement of leaves to the spiky shape of its flowers and stems. 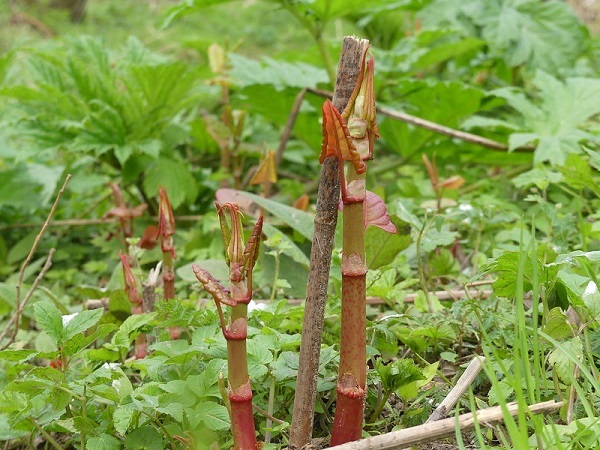 However, this plant is typically shorter than Japanese knotweed and contains a foamy substance in its stem, clearly visible when cracked open. So, having met its countless counterfeit counterparts, how do we know when knotweed is not the weed we know? The answer to that riddle is “with great difficulty”. The real plant itself has a varying appearance depending on the time of year and can be extremely difficult to detect and delineate, particularly during the winter months. When it comes to identifying Japanese knotweed, many homeowners will head straight to the internet for inspiration. The web can be a great tool to help you spot Japanese knotweed; however, it’s important to remember that this method is far from fool-proof. As we’ve seen, looks can be deceiving and your worst garden nightmare could actually be nothing to worry about at all. Think of it as the gardening version of self-diagnosing an illness online; while the web can be a great resource, it’s no substitute for a knowledgeable professional. If you suspect your home is under attack from the pesky plant of the Pacific, your best option is to call in the experts. With over 15 years of experience, Taylor Weed Control is a leading specialist in Japanese knotweed; not only can we accurately separate Japanese knotweed from its lookalikes, we can also treat and remove your unwelcome garden guest accordingly. Call 02920397554 or fill out our online enquiry form below for a free survey and tackle your weedy woes today!